This is really pretty. I love the texture. Thank you! I really debated on even showing this photo because I really didn’t like the grain from shooting at such a high ISO. Great tones and color in this. Really nice soft feel to it. Yay thank you so much Jerry! Aww thank you so much! What kind of camera do you have? Even point and shoot camera have SOME ability to control the aperture and shutter speed! I have a Canon PowerShot S3 is. I’ll have to look at the instruction manual to see how I can control shutter speed and aperture. I just love peach colored roses! Thanks for sharing this! Thank you! I splurged and got the Supernatural textures from Kaleidoscope on the advice of my friend Lynda. I am trying to break out of a rut lol. Gorgeous! what a beautiful shot to brighten the day! Thank you! I really should start doing prints… lol. Have you considered including your camera/lens/settings info with your photography shots? I love learning more about how to take such amazing shots. Well it is listed on the flickr page (if you click the photo) but that is a really good idea to have listed under the photo here at OSN as well!! EHEHE It’s funny how NO ONE ever seems to notice that! It’s like we are in some elite club now! 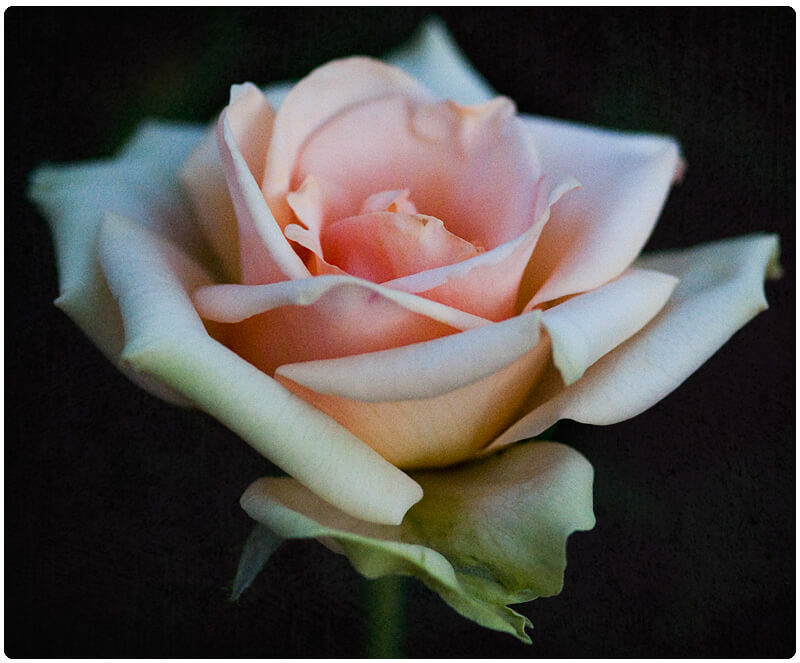 Your photo captures the detailing on the rose .. and its such a beautiful colour too ! I use an Olympus Su1050 so I’m pretty sure my flash might have ruined this pic ! but its a lovely way to start the day ! Thank you! I really worried about this shot because it was REALLY dark, I was shooting at a very high ISO and just ugh. Everything was against me LOL! Gorgeous peachy color rose. Beautiful image. Aww thank you so much Amanda! Thank you! I really love the tone too, it just, surprisingly, came out really well! Wow! Your site AND photography are gorgeously amazing. Happy WW! Aww you are too kind, thank you so much! Great Shot! I think it looks better in the photo than it would in person! LOL I don’t know about that, I was SURROUNDED by hundreds of varieties of roses at the botanic gardens at the time! I love this picture a lot. Its so simple and soft. It would make a great print, imo. Thank you! I am so awful at making prints, I just wouldn’t know where to put them in the house! I print out a lot of mine and then hang them on these magnetic photo rope things. I hang up my favorites and just rotate them out. that’s an awesome shot! :) And the “grain” kinda gives it a… uh… *thinks* mosaic? look. like it’s made from other teeny tiny pictures. But I could be wrong. Ignore me… I LOVE IT! OHH that is such an interesting way of looking at it! Thank you!! I’m a guy, but have to admit I looked at that for awhile. It’s a great image! Oh same here! Hopefully next year I can get some roses and peonies planted.